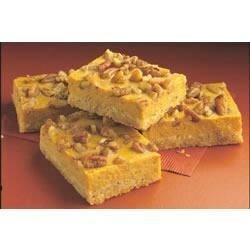 "These delicious pumpkin bars are made with a cakey crust layer, a creamy cheesecake layer, and a crunchy nut layer for maximum satisfaction." Preheat oven to 350 degrees F. In large bowl, on low speed, combine cake mix, 1 egg, butter and 2 teaspoons pumpkin pie spice until crumbly. Press onto bottom of 15x10-inch jellyroll pan. In large mixing bowl, beat cream cheese on low until fluffy. Gradually beat in sweetened condensed milk, then remaining 2 eggs, pumpkin, remaining 2 teaspoons pumpkin pie spice, and salt; mix well. Pour over crust; sprinkle with nuts. Bake 30 to 35 minutes or until set. Cool. Chill; cut into bars. Store covered in refrigerator. This was amazingly delicious ~ better than pumpkin pie!!! I used a yellow cake mix for the "crust". Yummers! !